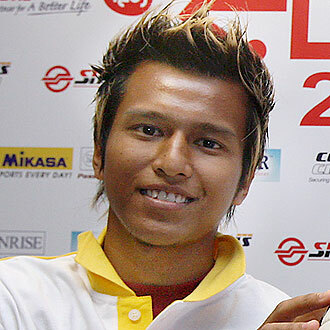 S-LEAGUE footballer Aliff Shafaein was arrested on Sunday on suspicion of drink driving and driving while suspended, after he was involved in a car crash hours before he captained Tampines Rovers in the Singapore Cup final. Two women needed hospital treatment after the accident on the morning of Tampines’ match against Bangkok Glass, which the former lost 0-1. Aliff’s coach and team manager were left fuming after they learnt of the vice-captain’s arrest, which he failed to tell them about before the match on Sunday. The attacking midfielder was acting team captain during the match, but was substituted in the second half because of his poor performance. Aliff, 28, was believed to have been driving a relative’s black Honda Jazz along Lentor Avenue towards Yishun when it collided with another car. The other driver, a 30-year-old woman, and her passenger, a woman in her early 20s, were taken to Khoo Teck Puat Hospital. They were said to have been treated for minor injuries. Aliff, believed to have been handcuffed when arrested, was unhurt. It is understood that he was able to play in the match because he was released on $10,000 bail. Team manager Syed Faruk said he had been able to contact Aliff only via SMS after learning of the arrest yesterday, and was very disappointed with the player’s actions. Mr Faruk added that Tampines coach Vorawan Chitavanich was very angry when he heard about the incident. ‘He (Aliff) wasn’t playing his usual game. I think the coach suspected something was amiss, but we didn’t know what happened, nobody told us anything,’ the team manager said. He added that the other team members had not known of their vice-captain’s arrest, although they knew he was in a car accident that morning. Aliff is known to have had more than 50 unpaid summonses over the past two years, believed to total up to $30,000. Mr Faruk had helped him settle the bill. Police confirmed yesterday that ‘a man in his late 20s was arrested for drink driving and driving under suspension of driving licence’. Aliff did not respond to calls from The Straits Times last night. His teammates said they were surprised to hear of his arrest, as he appeared normal during the match. Attacking midfielder Shahdan Sulaiman described Aliff as a ‘good person’ who does not talk very much. The future of the Tampines vice-captain, who has been with the club since 2004, now seems uncertain as his contract will run out by the year end. Mr Faruk said discussions will be held with the club’s committee, chairman and general manager tomorrow or on Thursday, before they decide on whether to renew Aliff’s contract. The above incident is an example of sheer stupidity and irresponsibiity at its best. But worse of all, it deals another hammer blow at the image of the local professional footballer. c) incredibly stupid (as shown by Aliff Shafaein’s reckless behaviour on the eve and morning of his club’s Singapore Cup final. I mean, is drinking the night before a Cup final the sort of behaviour a professional footballer should be indulging in? My jaw also dropped at the revelation that Aliff had chalked up over 50 summonses and over $30,000 in fines prior to his arrest. And that he was driving despite having his licence suspended. What is wrong with the bloody idiot? Does he not have a brain? For that matter, what is wrong with all these footballers? Is there any cause for wonder then that the general public has such a poor impression of our local footballers, and of football as a viable professional career? Sadly, the people who are going to suffer the most in this instance will be the members of Aliff’s family. From the report, it’s pretty clear that he is one of the main breadwinners of his family. He is already 28 years old. So if he ends up in jail for a lengthy period of time, it probably means the end of his livelihood as a professional player. For that matter, do you think that Tampines Rovers – who entrusted him with leadership positions in the team — or any other club would want to have him on their rosters now that they know the sort of irresponsible person he is? It’s all very stupid, very tragic and very sad. Singapore may have lost 1-3 to Iran tonight in their Group E Asian Cup qualifier at the National Stadium. But the Lions can still reach their first Asian Cup finals since hosting the competition back in 1984 after Thailand failed to beat Jordan in Bangkok in the other Group E tie. The Thais, coached by former Manchester United star Bryan Robson, were held to a 0-0 draw and the result means that Singapore and Thailand both have six points with Jordan on five and a game to play. But it will be tough for Singapore though. Reason: they have a tough away game on 3 March against Jordan who are also in contention for the second qualifying spot in the group. On the other hand, Thailand travel to Tehran to face Iran, who may opt to take it easy now that they have already qualified for the 2011 Finals in Doha, Qatar. Indeed, the win has eased the pressure on under-fire Iran coach Afshin Ghotbi who had been under fire from Iranian fans and media after a humiliating loss to Jordan in November. According to a Reuters report, Iranian fans at the National Stadium were even handing out posters of the coach with his face crossed out before kick-off. But all was forgiven after 12 minutes, thanks to Iran’s Hadi Aghily and Mehrzad Madanchi. Aghily scored a controversial penalty in the 10th minute after defender Precious Emuejeraye was judged by the referee to have tripped an Iranian player in the box. Minutes later, Madanchi made it 2-0 after Mustafic Fahrudin misplaced a pass on the edge of the box, allowing the Al-Ahli midfielder slot the ball past onrushing goalkeeper Hassan Sunny. To Singapore’s credit, the Lions, who had looked out of their depth at that point, had enough spirit and presence of mind to make a feisty comeback. And they were eventually rewarded for their efforts when skipper Noh Alam Shah scored with a superb diving header. Buoyed by the goal, Raddy Avramovic’s men went on to enjoy the best of the first period before the half time whistle sounded. And Singapore came agonisingly close to equalising just after the break. Shaiful Esah’s inswinging corner was flicked on by Baihakki Khaizan’s head. The ball sailed over the Iranian defence before Khairul Amri met it with a wonderful diving header. Alas, although the ball beat the Iranian goalkeeper, it didn’t find the net. Instead, it struck the crossbar and was then cleared to safety by the Iranians. The Lions’ luck ran out after that. And Iran eventually struck on the break to seal the win, creating a brilliant three-man move that culminated in a cheeky lob by veteran defender Rahman Rezaei over the powerless Hassan Sunny. From there Iran were comfortable in their lead and went on to qualify for the Finals. BANGKOK – Singapore banished all memories of a nightmarish defeat by Thailand on Saturday and climbed to second place in their Asian Cup qualifying group after snatching a crucial 1-0 away win against their South-east Asian rivals tonight. In front of a 45,000 crowd at the Rajamangala Stadium, lacklustre Thailand looked nothing like the side which beat Singapore 3-1 away on Saturday and paid the price for some sloppy defending and wayward finishing as former England international Bryan RObson suffered his first defeat as an international coach. Instead, it was Singapore that went ahead against the run of play 38 minutes into a scrappy game when Aleksandar Duric, A 39-year-old former Olympic canoeist, he leapt high in the air to connect with Shaiful Esah’s inswinging corner to beat goalkeeper Kittisak Rawangpa from close range. Kittisak was mostly to blame for the goal as he failed to exert his presence in the aerial battle with Duric, allowing the Singapore striker to get in front of him and feebly attempting to swat the ball away. Teerasil Dangda came close to levelling the score in first-half stoppage time when he skipped round two defenders but shot just wide of the far post. The hosts went all out for an equaliser and continued to dominate after the break, but Teerasil, Suchao Nutnum and Pipat Tongkanya each squandered perfect scoring chances in front of a Singapore defence that was marshalled ablely by Daniel Bennett and Precious Emuejeraye. Precious was a surprise replacement for Mohammed Noh Rahman especialy after a recent string of torrid performances for the Lions but the Nigerian-born player would have earned himself many redemption points tonight with his steady and confident performace especially late in the second half s the Thais piled on the pressure. Raw but impressive youngster Hariss Harun also put in a solid and promising performace in defensive midfield while Khairul Amri, a replacement for suspended strker Noh Alam Shah put n a display full of effort and running for a second game. Howver, Singapore also suffered a blow in the 30th minute of the game when hard man Mustafic Fahrudin had to be taken off because of an ankle injury inflicted by Datsakorn Thonglao. He was replaced by Noh Rahman who also redeemed himself with a efficient performance after Saturday’s quiet display. The win moved Singapore into second place in Group E with six points, leaving Thailand third on five. Iran lead on seven, with the top two qualifying for the finals in Qatar 2011. Robson rued his team’s poor marking in his first defeat as Thailand coach but said he was confident they would still qualify.